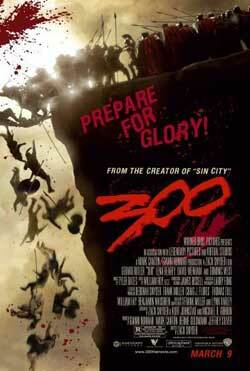 Based on Frank Miller's graphic novel, Director Zack Synder's 300 is a straightforward battle epic cut from the same cloth as Braveheart and Gladiator. I couldn't help feeling that this excellent film, which follows the Spartan King Leonidas as he leads an army of 300 of his men (and 7,000 Greek volunteers) to fight a hopeless battle against the perhaps million-strong Persian Empire, was closer to what most of us had been expecting Apocalypto to deliver. Of most interest to me, however, is the blasphemous but inevitable verdict that has again gone out: the movie is better than the comic. Like the film version of Sin City, 300 is immensely faithful to the graphic novel, duplicating Miller's illustrations often shot for shot, and mirroring the storyline and dialogue save for the most minor omissions and embellishments. But, perhaps, the devil is in the details. A closer look at the film version reveals that it smoothes out not only the rough edges of Miller's style of illustration, but also the story itself. Kept is everything that makes Miller's 300 palatable: the smoky and otherworldly vistas, the manly men, and the bloody bedlam. Meanwhile, erased are many of Miller's hit-and-miss idiosyncrasies: his tendency both toward caricature and minimalism, the understated sexual ambiguity of the good guys, and Miller's, well, Spartan storytelling. A welcome addition to the film version of 300 is a look at some of the tactics the Spartans might've actually used to defeat the Persians in battle, which the comic conveniently glosses over. The movie has also embellished elements of the storyline to wring some more drama out of the tale and bring it to true epic status. The role of the queen has been considerably beefed up, adding an entire subplot to the story that certainly was meant to cater to female moviegoers, but which isn't unwelcome. Gone is the abrupt appearance and death of the Spartan captain's son; now his role is foreshadowed to really rip at the heartstrings. Gone is also the comic's borderline-grotesque illustrative style, familiar in Miller's art even in his depiction of heroes and heroines--not unlike what we imagine Greek gods might actually look like. Left are only the chiseled, gorgeous bodies of the 300 that have been making ladies swoon in theaters everywhere. As a form of recompense, Snyder seems to have funneled Miller's taste for deformity completely into populating the ranks of the Persian enemy with actual monsters, maybe the film's only truly unfortunate modification. A Persian friend of mine huffily felt the need to explain that the Persian army did not in fact recruit ogres and mutants, and that she had to keep reminding herself that the movie was based on a comic book; I felt the need to clarify that the comic book didn't actually have any monsters in it either. Is the film better than the comic? I'll say yes. Is the comparison fair? In the case of comics vs. movies, I'll again say yes. One might argue that Miller's storytelling in the comic was intentionally overly simplified. But when it's all said and done, it's a weak excuse, because the current form of the graphic novel medium shares all too much with its cinematic cousin. As Scott McCloud remarks in Understanding Comics, the comic book still has maturing to do, and most writers in the medium are still not taking full advantage of its unique attributes. If great visual feasts like Katsuhiro Otomo's Akira and Frank Miller's Sin City and now 300 continue to bedazzle our senses on the big screen to far greater effect than in their original forms, it speaks of a terrible disparity between what comics are and what the medium is actually capable of achieving. If, thanks to improving visual effects capabilities, comics no longer hold dominion on hyperbolic images and action, then the writing component of comics, so often playing second fiddle to illustration, is going to have to start taking itself far more seriously.